It's 1996, and Josh and Emma have been neighbors their whole lives. They've been best friends almost as long - at least, up until last November, when Josh did something that changed everything. Things have been weird between them ever since, but when Josh's family gets a free AOL CD in the mail, his mom makes him bring it over so that Emma can install it on her new computer. When they sign on, they're automatically logged onto their Facebook pages. But Facebook hasn't been invented yet. And they're looking at themselves fifteen years in the future. First Line:"I can't break up with Graham today, even though I told my friends I'd do it the next time I saw him." 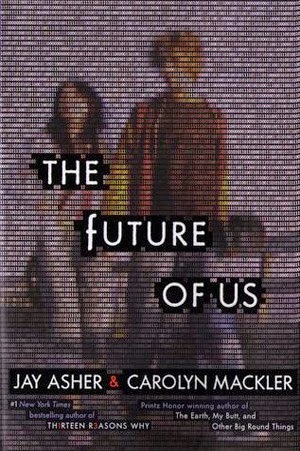 Review:Being a 90's kid I was really excited to finally start The Future of Us...I mean I really wanted to love this one but the characters especially Emma made me cringe so many times that I couldn't even come close to loving it let alone truly liking it. Emma was my biggest issue. She is shallow. She dates guys based off their looks and that's it and I'm sorry saying she is a teenager is a great reason behind her dating preference is not a good enough reason I give teens a lot more credit then that, heck I used to be one and there were a lot more factors then just looks that mattered to me and my friends when deciding who we may have wanted to date. I mean she broke up with a guy because he shaved his hair then again she was with him because he had good hair? And when she somehow mysteriously finds herself looking at Facebook which shows her how her life will be in fifteen years all she is focused on is who she will marry and then changing it and then being unhappy with that and trying to change it again and what baffled me was she was making these huge changes to her future based off status updates that were pretty vague. Then I couldn't stand how she treated Josh. She knew he had feelings for her but still kissed him not because she liked him but because she wanted to see if that would change her future in some sort of way not caring at all what it would do to Josh. I don't know...I just found her to be selfish, whiny and incredibly annoying. As for Josh he was your typical teen but didn't really stand out in anyway. I don't even know what he saw in Emma. I was actually rooting for him to be with Sydney she seemed a lot more interesting then Emma. Overall I think the premise was great but it was wasted on sub par characters.The only thing I liked was all the 90's references...loved it.